We’ve been to Aruba some fifteen times. So we know the territory well. This is an island where you want to go and get settled in the hotel, then with your rental car, start exploring the Arubian countryside like crazy. And you can keep doing that for a week and still see new things each trip. That’s how awesome this place is. Yes, it was plagued a few years ago by a case of a teen who vanished – but that could happen anywhere. Aruba is not the problem. When you land in Aruba, you just have to admit there’s a part of paradise located here. And the best beaches are on the southwest coast of the island, where constant trade winds keep you cool. Palm Beach, Aruba’s “Best Fun Beach” is our first stop. So how did Palm Beach merit this name? Well, every opinion about “best” is subjective. But this one is the winner, hands down. What’s more, you won’t have to go far. If you on an Aruba vacation, this is the beach that is probably located in front of your hotel. Palm Beach runs along the best high rise resort hotels and time shares on the island. When you arrive, surprise yourself and look out your hotel window. You’ll have one of the most spectacular views of beautiful Palm Beach and the turquoise waters of the Caribbean. What to do on the best beach of the island? Since Palm Beach is home to the high-rise hotels, you can definitely get in some people-watching here. 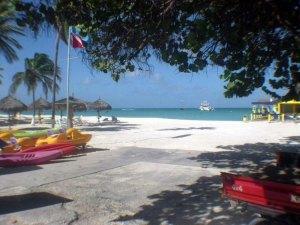 Just next to Hadicurari Beach, Palm Beach Aruba is great for swimming, tanning, fishing, sailing, and snorkeling. You can spend over an hour walking from one end to the other. Now, what’s fun about this is that you’ll be able to stop at the high rise hotels for refreshments. Each resort opens their property to the beach and have everything from snack bars to open bars. A few have beautiful gardens and waterfalls complete with animals. And if you’re the more adventuresome type, several places along Palm Beach Aruba offer water sports. Hotels and resorts offer Hobie Cats, jet skis, windsurfing, scuba, beach shelters, toys and more – plus, they offer instruction in each of these areas. 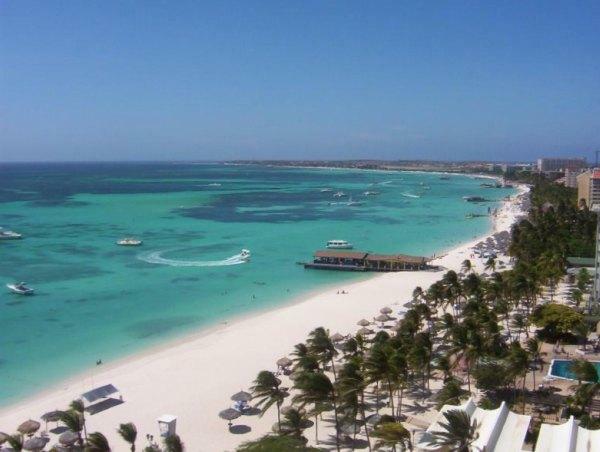 Here’s a tip: Because Palm Beach is located in the center of the action on Aruba, it can get crowded. It’s busier, noiser – but some find that fun! However, note that the less crowded areas are to the north, toward the Marriott, and south, near the Divi Phoenix. Two side notes; the Marriott is constructing a timeshare near their hotel – beware of the noise, and some say the wind down near the Phoenix is powerful. If your hotel is not on Palm Beach, make sure you visit on your Aruba vacation. There is parking along the road in front of the hotel and resort strip. You can park at some of the hotels. Best time to visit is during the mid morning for sun bathing, late afternoon for walking and enjoying the views. 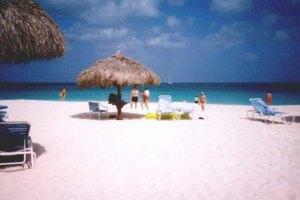 Want to learn more about Palm Beach in beautiful Aruba? Check out Palm Beach here! Perfect..that’s where I’m staying in 8 months. Hopefully the noise will be gone by then. white sand, long and wide shores, not to few but not to many waves (depends on the season) and the best of all is its sand; it is not muddy and it doesn't smell funny like Palm Beach. After all… it's just an opinion. If you're into Palm Beach I'd recommend Riu and Westin areas. I wanna go here one day! I’ve heard so many good things about Palm Beach, Eagle Beach, and Aruba in general. This is definitely on My Places to Visit List.